Many people view games as only a source of entertainment. Some view it as an artform. But not many realize, and fewer utilize, its unique and powerful characteristic; You can fail. 'This isn't news,' you may say, 'People fail all the time!' Ah, yes. Any task with an objective has an inherent possiblity of failure. At games, however, you *can* fail. You are allowed to fail. Failing is an option, and even expected. And the failure is confined within the game, with no reprocussions beyond its boundaries, mainly reality. 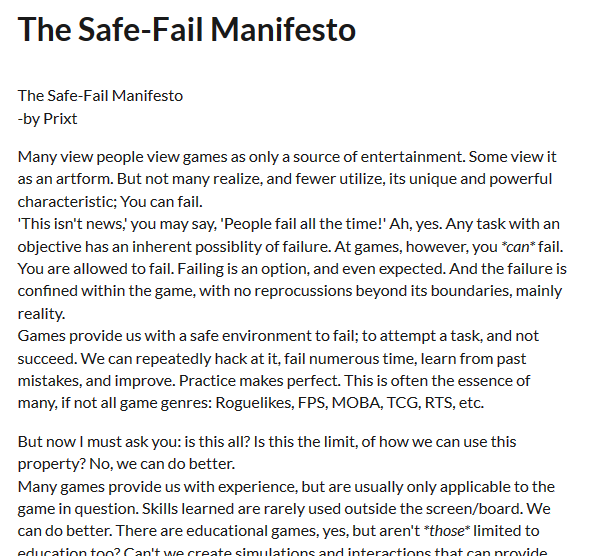 Games provide us with a safe environment to fail; to attempt a task, and not succeed. We can repeatedly hack at it, fail numerous time, learn from past mistakes, and improve. Practice makes perfect. This is often the essence of many, if not all game genres: Roguelikes, FPS, MOBA, TCG, RTS, etc. But now I must ask you: is this all? Is this the limit, of how we can use this property? No, we can do better. Many games provide us with experience, but are usually only applicable to the game in question. Skills learned are rarely used outside the screen/board. We can do better. There are educational games, yes, but aren't *those* limited to education too? Can't we create simulations and interactions that can provide more general knowledge? Knowledge from various categories, various walks of life, various genres. Often knowledge gained from games are technical and methodical. Mechanical knowledge, while useful, is only a limited to, well, mechanical problems. But we know life isn't composed of only problem-solution pairings. It is made of unclear elements, full of blurred lines, and full of questions with no concrete answers. Why not allow players ask, and allow them to play to answer their philosophical queries by themselves? Failing can teach them if their beliefs hold water, or if their world view is worth protecting. Why not make us feel vulnerable, emotional, conflicted in ways that are only accessable through failure? While games are a departure from reality, they are inevitably inspired by reality. Reality however, is unforgiving. All actions are an echo of past actions, and all actions ripple to future actions. There is little room for practice, fewer for experimentation, unless you pay severe prices. Games can provide a protected environment. An opportunity to try things oulandish and unreasonable, but with little consequence. It can provide us with experiences hard, if not impossible, to obtain in real life. So, I implore to those who are capable of, or are on the path toward, game creation. Allow us to fail. Give us games where we can fail. Fail to understand, fail to overcome, fail to succeed, fail to survive, fail to exist, fail in ways we don't even know. And to those who play games, do not be afraid to fail in games. 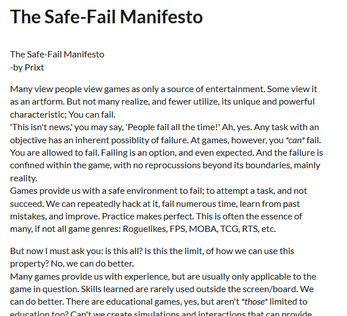 Games are meant to be failed by design. Games cannot kill you. And what doesn't kill you makes you stronger. This was a really beautiful read! !